New Human Species Found In a cave on the Indonesian island of Flores, scientists unearth the bones of a new species of human... a find that could rewrite the history of human evolution. About three feet tall when fully grown, Homo floresiensis resembles our most primitive ancestors, but lived as recently as 13,000 years ago. The near-complete skeleton of H. floresiensis was found in Liang Bua, a large limestone cave on the Indonesian island of Flores. In a cave on the Indonesian island of Flores, scientists have unearthed the bones of a species of human never seen before. About three-feet-tall when fully grown, Homo floresiensis resembles some of our most primitive ancestors — but lived as recently as 13,000 years ago. They made tools and hunted dwarf elephants, but were physically unlike modern pygmies. Scientists say it's possible h. florensiensis mingled with modern humans; they were both in the region around Indonesia around the same time. The discovery suggests we shared the planet with other species of humanity until quite recently in evolutionary terms. The findings, published in this week's issue of the British scientific journal Nature, also suggest that humans may be subject to the same evolutionary pressures as other mammals, shrinking to dwarf size when isolated in a resource-poor area. NPR's Christopher Joyce reports. 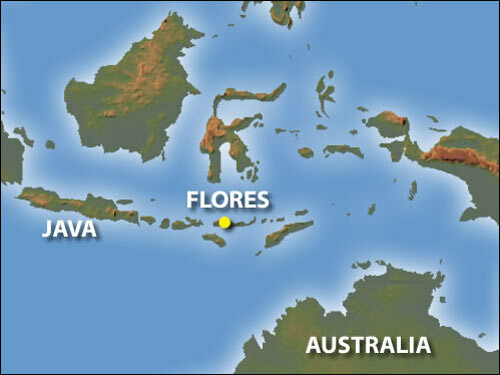 Three of the papers' Australia-based authors — Peter Brown and Mike Morwood of the University of New England, Armidale, and Bert Roberts of the University of Wollongong — shared their thoughts about the Flores discovery with the journal Nature. That exchange appears below, courtesy of Nature. Q: What, in your opinion, is the most interesting part of the find? Peter Brown: The two most interesting aspects of this find are connected with biology and behaviour. At present it appears that these small hominins are the result of endemic island dwarfing. Although a common feature of large mammals in insular environments, this has never been recorded for a human relative before. It is a clear indication that hominins are subject to the same biological processes as all other mammals. We are relatively intelligent toolmakers, but apart from that, we are not particularly special. Secondly, the association of these small-brained hominins with sophisticated tools may have implications for their neural complexity and associated behaviour. It should promote a major re-think of the social and behavioural complexity, and capabilities, of our small-brained Pliocene ancestors—even more so if it becomes clear that they used watercraft to get to Flores. a) Some of the skeleton's features hark back to much earlier in the hominin sequence than the earliest Homo erectus finds from Java. Some of the 1.8-million-year-old finds from Dmanisis in Georgia are the closest match. b) The little hominins lived at Liang until about 12,000 years ago. This is remarkably recent and overlaps by tens of thousands of years with modern humans in the region. Documenting the nature of interaction between us and them is a future priority. c) The complexity of behaviour exhibited by the little hominins is unexpected given their small brain size. Communal hunting of Stegodon, use of fire and making sophisticated stone tools are all evident in associated deposits. Bert Roberts: The fact that, up until September last year, we had absolutely no clue whatsoever that a completely new species of human spread from far-western to far-eastern Asia from 2 to 1 million years ago, and managed to survive alongside modern humans until almost historical times in the farthest outposts of southeast Asia. It's the most fabulous testimony to the appalling preservation potential of fossils in the geological record, and makes you wonder just how many fossils of other human species, as well as other members of the animal kingdom, lie concealed in some subterranean time capsule, patiently awaiting discovery! Q: Can this be compared to any other discoveries in recent years? Peter Brown: Most of the other hominin discoveries over the last two decades could have been predicted by what had come before. Although finding H. erectus at Dmanisis dating to 1.8 million years was unexpected, the anatomy of the fossils was not surprising. Prior to Liang Bua, it was believed that hominins of this stature and brain size last walked the planet 3 to 4 million years ago in Africa. Finding these hominins on an isolated island in Asia, and with elements of modern human behaviour in tool making and hunting, is truly remarkable and could not have been predicted by previous discoveries. Mike Morwood: There are no comparable early hominin discoveries in southeast Asia since Eugene DuBois' finding of the type H. erectus specimens at Trinil, East Java, in the 1890s. Bert Roberts: It's rare, extremely rare, to find a hitherto-unknown species of human living in the recent geological past. Generally, it's the oldest occurrence of a hominin that makes waves, not the most recent! In fact, the remains of our most recent human relatives — Neanderthals in Europe and H. erectus in Java — were discovered in the 19th century. So the discovery of the Flores species is the first report for more than a century of a new species of human overlapping in time with Homo sapiens. Q: How can you be sure that it's not a one off? Peter Brown: The remains of at least two to three individuals were recovered from the excavation in 2003, and this number has expanded to five to seven with the results of the 2004 field season. Whether or not this species was restricted to the island of Flores only the future can tell. Mike Morwood: We have evidence from Liang Bua of between five and seven "Flores man" individuals spanning about 80,000 years. Almost certainly, similar endemic hominin species will turn up in other parts of southeast Asia: the Wallacean islands of Sumbawa, Lombok, Timor and Sulawesi being prime candidates. Bert Roberts: We now have the remains of at least seven hobbit-sized individuals at the cave site, so the 18,000-year-old skeleton cannot be some kind of "freak" that we just happened to stumble across first. The other individuals all show similar characteristics, and over a time range that now extends from as long ago as 95,000 years to as recently as 13,000 years ago — a population of 'hobbits' that seemed to disappear at about the same time as the pygmy elephants that they hunted, both apparently falling foul of a volcanic eruption about 12,000 years ago. But local legends have it that such hobbit-like creatures survived farther east until almost historical times. Q: Did this species ever come face to face with modern humans? Peter Brown: Although modern humans had reached Australia by 45,000 years ago, there is currently no evidence of any overlap between modern humans and this species on Flores. "Flores man" was probably restricted to the rainforests and became extinct, along with Stegodon, after a massive volcanic eruption around 12,000 years ago. 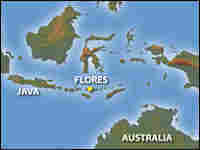 There are many potential routes by which modern humans may have reached Australia, and no need for them to have passed through Flores. Mike Morwood: Given the long period of overlap between modern human and "Flores man" populations in the region, it is certain that they came face to face on occasion. Further archaeological work on Flores may yield evidence for the nature of their interaction. Bert Roberts: We don't know for certain. We have skeletal remains of modern humans in Borneo (Niah Cave) about 43,000 years old, and in southeastern Australia (Lake Mungo) about 40,000 years old, so there were certainly modern humans on the Asian and Australian continents (Borneo forming part of the Asia mainland during the ice ages), which lie on either side of Flores. 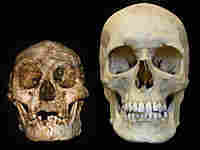 So, on the face of it, we should expect at least 20,000 years of overlap between H. sapiens and Flores man. But the earliest direct evidence for modern humans on Flores is just 11,000 years ago, immediately above the layer of volcanic ash that sealed the fate of the hobbits and the pygmy elephants. So did the two species ever meet one another? Perhaps, but perhaps not! And this is one clear instance of where the search for evidence must continue! Q: What is next for your work? Peter Brown: My current research is concentrating on finding the putative ancestor of Flores man and seeing whether this is the predicable result of dwarfing in a range of potential ancestors, including H. erectus and H. habilis. The problem is that although there is evidence of stone tools on Flores dated to 840,000 years ago, there is no associated skeletal material, and all examples of H. floresiensis are already small-bodied. Although it is most likely that Flores man is descended from large-bodied ancestors on Flores, these are still to be found. Mike Morwood: We plan to investigate other sites on Flores, Java and Sulawesi, especially deeply stratified limestone caves, to obtain evidence for a number of fundamental issues in the archaeology and palaeontology of the region. For instance, when did hominins first arrive and what happened to them? When did modern people first arrive in different parts of southeast Asia and how? When did cultivation and animal domestication first begin? What were the later impacts of the introduction of pottery, cereal crops and metal? And what were the changes in climate, fauna and vegetation associated with major changes in the archaeological record? Bert Roberts: Aside from the search for evidence of the earliest modern humans in Flores, we shall also scour other remote Indonesian islands for their own array of extinct, endemic animals, which may well include other species of human. Sulawesi is an obvious target, being famous for a range of bizarre and unique creatures that imply a long period of isolation — a necessary precursor to endemism. Perhaps the far-flung Indonesian islands have acted as a series of independent "Noah's Arks," each with their own trademark endemic dwarfs and giants. In this regard, no amount of navel-gazing and hypothesizing can substitute for dogged field work, because only by excavating deposits will surprises such as Flores man be brought to light. ·	The H. floresiensis bones described in Nature were discovered in September 2003. Analysis indicated they belonged to a woman of 30 or so. ·	The remains of several other individuals have also been found. ·	Though hobbit-sized, the Liang Bua skeleton was perfectly well proportioned, and may represent the descendants of a population of Homo erectus that became isolated on Flores during the past few hundred thousand years. ·	Living on a small, resource-poor island with few predators may have selected for smaller body size. ·	Modern humans are also believed to have evolved from Homo erectus. ·	H. floresiensis lived as recently as 13,000 years ago, at a time when the entire region had already been colonized by Homo sapiens. ·	Consistent, detailed folk tales about "little people" abound on Flores.